Kodak Park, the huge industrial complex that dominated Rochester, New York, for more than a century, is getting smaller both figuratively and literally. Once comprised of more than 200 buildings and 20,000 workers, by 2008 Kodak Park will employ about 10,000 workers and comprise barely 100 buildings. 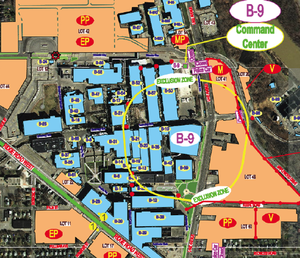 As part of an ongoing plant reduction program taking place throughout the year, two major structures are scheduled for implosion this weekend: Building 9, most recently used for color paper finishing, is scheduled for demolition just minutes from now as I write this, at 8:00 a.m. Eastern. Building 23, a former major engineering and design facility, will go down at the same time tomorrow. Want to see? Check the website of the Rochester ABC affiliate, 13-Wham. Destroying unneeded buildings will save maintenance costs and taxes for the company as it continues to restructure in the new business environment (the link is to a Kodak employee memo posted on APUG). New York City Mayor Mike Bloomberg's Office of Film, Theater and Broadcasting is proposing to require any group of two or more people who want to use a camera in a single public location for more than a half hour to get a city permit and insurance. This means the streets and sidewalks of New York. The rules are sufficiently vague to give police broad power of discretion, and since they are only human, this means they can discriminate against anyone or any group they choose. Featured Comment by mwg: "For those of us in fly-over country, I don't think it would hurt to write to Bloomberg's office and let him know that we'll take this into consideration when planning our vacations. While this will presumably be selectively enforced, the net result is a less friendly environment for photography. I see no reason to spend my money in a place where I can't indulge in my hobbies without fear of harassment." 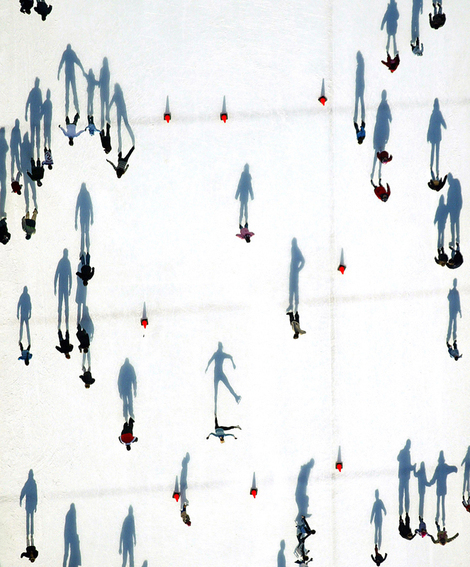 Skaters at the Lasker Rink in Central Park are dwarfed by their shadows, at least in this aerial view by Pulitzer-prizewinning New York Times photographer Vincent Laforet, February 22, 2004. 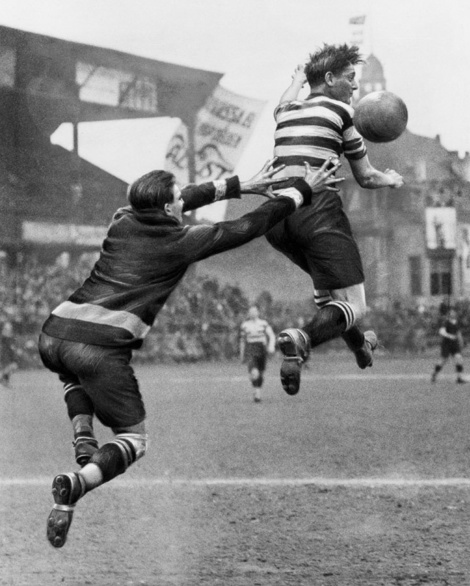 Prints of this picture (and a great many others) are available for sale at The New York Times Photo Archives. I love this shot. First you tend to read it as abstract, then you start reading the shadows—the two parents holding the child by the hands, the skater with one leg in the air, the lone figure in the middle (who I notice somewhat later) in that peculiar insecure-skater posture, knock-kneed, wings out for balance. The colors and the vividness of this remind me somewhat of Kent Phelan's St. Louis Stadium picture, although of course they're very different. I might add that I love looking through these archives. Yet another guilty pleasure, I'm afraid. It's late as I write this and I want to get back to "regular programming" tomorrow (Ctein has a post awaiting publication, and I'd like to say more about Wood, Water, and Light by Mendlowitz and White), so just a few final final recommendations, after three days of vigorous chewing on the issue of copyright. The issues involved in presenting work and protecting it are somewhat at odds. Few of us want publicity at the cost of control, and few of us want complete protection at the cost of any sort of exposure. Thus, a balance is usually what is sought. You need to find your own balance, one that you are comfortable with. The following is what seems reasonable to me; but you might want to modify these ideas to find your own balance. • In general, copyright notices and reminders are probably a good idea overall. But be aware that prominent or aggressively placed notices might discourage some people from sharing your work with others (and not all such sharing is bad for you). • If you put a copyright notice on or very near each of your pictures, it might be a good idea to add, somewhere nearby, either in language or via Creative Commons symbols, some indication of how you would like your pictures to be treated. • If you are seeking or would welcome recognition, publicity, and/or customers, it is probably wise to make it relatively easy for people to contact you. • If you want to put a notice on the picture itself, I suggest you use your website address or email address (unless you have a very distinctive name). I say this speaking as someone who has spent many hours trying (and often failing) to track down Joe Blow from a notice that just says "© 1999 Joseph Blow." • The best protection against piracy is not to put your picture on the internet at all. Next best is to use a very small, low-resolution, poor-quality JPEG that no one will be able to use for much of anything even if they want to. Unfortunately, these measures directly conflict with the goal of presenting your work so that others see and appreciate it. Personally, I feel that it's worth it to make your work look good and suffer some piracy, rather than be miserly about it. But make your own determination. • Seriously consider registering copyright on your "best" or "signature" images. It's time-consuming and expensive, so very few people do it for all, or even a majority, of their pictures; but we all know that most of our work is not terribly remarkable. We usually know what our best stuff is. Anyone who uses your picture to make any kind of serious money will probably also be a "big fish" with deep pockets and significant resources. In fighting a battle with that sort of opponent, previous registration of your copyright will do you a world of good. As an example of perhaps the best way of handling your online images, check out my friend John Lehet's site at www.lehet.com. He's just transitioning to marking his images, so not all of them are marked, but those that are have an unobtrusive mark with a faint copyright symbol and his website address (note that this is not a legal copyright notice; the copyright symbol in this case is just a reminder). It doesn't interfere with the pictures, but unless a pirate deliberately obscures it, it makes it possible for people encountering his JPEGs elsewhere to find their way back to him. He uses relatively large JPEGs that make his work look good, which leaves him open to theft, but the protections he's put in place are judicious and well considered. Now go to the bottom of his home page and click on "Licensing." The main goal of his site is to sell prints; but here, John spells out what else his pictures may and may not be used for and how interested parties can proceed. This is enormously helpful to any photo researcher. Finally, note that he makes it easy to contact him (in several ways), for further information or to get questions answered that aren't covered at the website. • No system is perfect. You sacrifice some protection for the sake of presentation, and you may lose out on some publicity for the sake of preserving your rights. So don't take it too hard when something goes awry one way or the other. Find your own balance, be open to modifying it in the future in case it's not working for you, but then try to relax and not worry about it too much. This stuff can drive you crazy if you let it—and it's seldom worth that. I hate writing about copyright, I really do. It's one of those perennially misunderstood subjects like depth-of-field and angular perspective that never fails to get people quarreling, and that seems to resist clear explanation. Moreover, even clear explanation sometimes doesn't help, because not everyone agrees no matter what's said. At root it's about peoples' feelings, about their work or the reception their work has received in the world, and on that score there's just never going to be complete and harmonious accord. I see that my old friend Bruce has raked me over the coals in the comments to the previous post, calling my use of images on this site "unprofessional." A perfectly viable opinion. It's also perfectly understandable, since Bruce happens to be a high-dollar, full-time New York City studio and editorial professional. So it makes sense that his opinion is that of other professionals and their agencies and associations. Of course, what I was suggesting in the original post is that this is just the attitude that may not be appropriate for amateurs and hobbyists who would prefer to get their work seen more widely, as opposed to girding their rights in chain mail and armor plate and remaining perfectly protected from ever having their work looked at. Don't agree? Okey-dokey. I'm not insisting I'm right about this. Go ahead and mark your pictures with whatever notices and protections you want to. They're your images. My son and his buddy about to leave for summer camp. Limited one-time use in return for large amounts of money is possible if you're feeling lucky and I'm feeling generous. All rights reserved. It's simply been my observation that some people "protect" themselves right into a black box of perfect invisibility where no one ever sees them. A little story: when I was a photo magazine editor, we were considering doing a portfolio of work by a young nature photographer. He had sent us a 4x5 film box full of chrome dupes. We'd decided against using his work for the portfolio, but I asked him if I could just hang on to a few of the dupes for a cover meeting we had coming up, although I explained to him that the likelihood of one of his pictures ending up on the cover wasn't too high. "Sure," he said, "just pay me your going rate for anything you use, and return the dupes some day if you can." That was the extent of our agreement. We didn't use any of his pictures, and I did return the dupes, but what I remember is that he and I had a long discussion about how hard it was to make one's living as a nature and wildlife photographer. This guy was struggling—chiefly, he felt, because most of his sales were to stock, and he had "only" 650 unique images in his stock library. These were gorgeous 4x5 Velvia chromes that looked like David Muench pictures, many available in both horizontal and vertical format, done to an extremely high professional standard, taken all over the world—the Andes, New Zealand, the Yukon. He felt he was in a race to expand his stock catalog to 1200 or 1800 images, and it was an open question as to whether he was going to make it or not. A few days later, I received a submission in the mail. It consisted of three lonely 35mm slides in the middle of a single Clear-Vue page. All three pictures were of the same nondescript mountain, in the middle distance, with a bland sky behind it and random trail foliage in the foreground. It wasn't much of an editorial dilemma—my feeling is that most home scrapbookers would have decided against them for inclusion in "Our Trip Out West." The cover letter explained that the Artist was about to graduate from photo school and intended to make his living thereafter as a nature photographer. Since he was poor, he said, he had not been able to actually take very many nature shots yet, but requested that I take a look at the enclosed nature shots from his "portfolio." To use them on our cover, all I had to do was sign the enclosed contract. What followed was SIX PAGES of single-spaced legal boilerplate specifying what I had to pay him for every usage you could possibly conceive of, limitations on my rights, stipulations as to kill fees, strict limitations as to how long we could consider his images, agreements on settlements the magazine would have to make to him if we somehow stepped over one of these legal boundaries...it went on, and on, and on. I think you can draw your own conclusions about the comparison. 1. 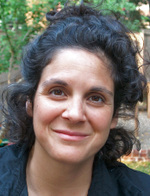 Although—as you may have noticed—people like to make absolutist statements about copyright as if it were a hard-and-fast thing, in fact copyright law is malleable and ever-changing, because it's not just what Congress and the Berne Convention say that goes—it also depends on the weight of precedent and how the courts interpret the laws. The law is constantly being challenged and amended and tested and changed. So even an attorney who specializes in copyright can't tell you with 100% certainty what your rights really are, much less whether you'll win or lose any given case. 2. While it's true that your rights are granted from the moment of creation whether you place a copyright notice on or near it or not, in practice you have further obligations as to diligence. The presence of a notice can (probably will) affect your potential damages. Since the way you exert your rights is to sue for infringement and make the infringer pay, this has a practical bearing on your rights. So it's still better to have a copyright notice on or near your JPEGs if you intend to be a stickler about infringement. 3. Further, as a practical matter if you intend to pursue legal action you must have registered your copyright first. (You don't have to do this to own the copyright, but you have to do it if you want to sue for infrigement, which as I mentioned is your only remedy against theft of your work. Furthermore, it has to have been done within 3 months of the creation of the work, or before the infringement, if you want to include your legal fees in your lawsuit.) Registration is expensive and time-consuming, and I'm willing to bet that only a tiny fraction of people reading this have ever registered their copyright for any image, much less all of them. As a practical matter, in the words of Brad Templeton in "10 Big Myths about copyright explained," "...if the work is unregistered and has no real commercial value, it gets very little protection." Moral rights and actual legal protection are unfortunately quite far apart. 4. Like it or not, fair use covers the way we use images on TOP. Subsection 107 of the 1976 Copyright Act states, "...the fair use of a copyrighted work...for purposes such as criticism, comment, news reporting, teaching..., scholarship, or research, is not an infringement of copyright." In practice, as I understand it, the courts judge both intent and actual monetary damage in assessing if something is not fair use. Obviously, that isn't the most comfortable situation for somebody in my position, because there's no person, body, or agency that can indemnify my use of an image in advance—I simply have to apply my best (amateur) judgment, and hope that if I'm ever challenged, the (expert) courts and lawyers would agree with me. Still, the bar would be mighty high for someone who wants to sue me for using their image on this site. If TOP is not presenting images in order to teach, comment, and criticize, then what are we doing? That's all we're doing. That's the whole point of this site. It could almost be our tagline (I'll have to consider that...). Furthermore, they'd have to prove that my use of their image lessened its actual value, when it demonstrably most often does the opposite, because we're usually furthering their own publicity efforts which are already in place on the WWW (that being where I got their image in the first place, usually). And finally they'd have to prove malign intent on my part, which would be very difficult indeed, since I could marshall a lot of testimony to the opposite effect—probably plenty enough to demonstrate benign intent. "The response, which cuts right down to it for me, was something like this: 'Those cats can take whatever they want, I got plenty more where that came from, plenty more.'" The copyright notice was not on the guy's picture. My complaint had nothing to do with making the picture look cleaner so it would be more decorative on my site. I was really just frustrated that there was no way to contact him. I am not telling people not to put copyright notices on their images. When I can't use one person's photograph, I do just go find something else. Believe me, I could never post all the good pictures I find if I posted ten a day from here to eternity. I am not claiming or implying that TOP is all-important. 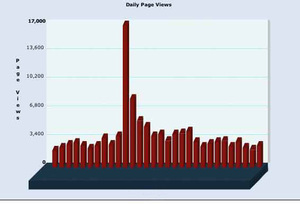 We got 88,000+ unique visitors last week by direct count, plus however many read us via syndication feeds. That makes us small by some standards (Luminous Landscape gets about 500,000 unique visitors in the same time period, Steve's Digicams at least double that) and large by others (many photographers with unpromoted personal websites get a few dozen to a few thousand hits a week). That spike is from when we did our piece about him. His reaction? "A thousand thanks for your blog post." That's what I hope for—and what experience has led me to expect—when I post someone's picture or link to her site. In other words, I'm not being evil. Or not trying to be, anyway. Do whatever you're comfortable with. It's your call. If you want legitimate users to feel free to use and promote your work for you, consider making it easy for strangers to contact you. If you'd like to give legitimate users access but don't want to be contacted, consider a "Creative Commons" license or its text equivalent. If you're absolutely not comfortable with anyone ripping off your picture ever, don't post it on the web at all. Ironically, that's what I do. Only a miniscule portion of my work has ever been digitized or put on the web. A few of my better digital shots have appeared online, but almost none of my black-and-white work has—the work which, until recently, I considered my "real" artwork. Reason? It's personal. That's what I'm most comfortable doing. Your work? Your call. Featured Comment by Mark Roberts: "Mike, your comments about the benefits of a photograph being displayed on your blog are well stated. The thing about the Internet is that that there's no 'six degrees of separation'—one degree will do the trick: A photo appears on its creator's web site; then you (quite reasonably, as you point out) show it on your blog; at which point it's saved by someone who visits your site; who emails it to some friends; one of whom puts it on his web site; etc. "After that first 'degree of separation' the photographer has no control over what appears with the photo. Whether or not any of these steps is legal or ethical, someone who, farther down the chain, sees the photo and wants to legally purchase a print (or reproduction rights) won't be able to do so unless the copyright has marked the image in some way. "Often a copyright notice isn't a petulant 'this is my image and you can't have it' statement, but rather a 'here's who I am and how you can find me.' I've sold prints to people who saw one of my photos being used as a computer monitor background by someone who just copied it from my web page. Who knows how many degrees of separation there were between my web site and the eventual buyer, but my copyright notice let them find me." 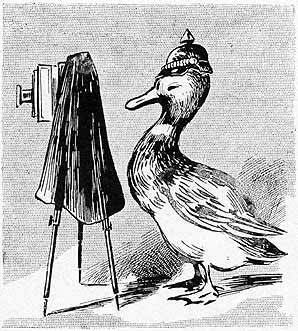 Congratulations to Aaron Johnson (and, of course, the Duck) of "What the Duck," who finally hit "Bingo" on the 18th of this month when Universal Press Syndicate offered to syndicate the comic strip. Aaron (and the Duck) are mulling the offer over. Check the "Syndicate Bingo" section of the WTD website for news and updates. Naturally, we'd like to see the strip continue to be entirely about photography after it gets famous, but that's just us. Sometimes I wonder about the wisdom of putting copyright notices on online JPEGs. Just this afternoon, yet again, I found a picture I would have liked to use for our "Random Excellence" feature. It was on a sleepy little site buried on a back page where it probably gets very little traffic, and the point of its being there is that the photographer, an Australian, is trying to sell prints of it for AUD$70. But when I went to get the larger version of it—probably all of 750 pixels across—there it was: "COPYRIGHT by," etc., big and bold. This means I have to a) contact the photographer to get explicit permission to post it here, or, failing a), b) not use the picture. And of course, in this case, although there were automated forms to help me buy the print if I wanted to, there appeared to be no way to contact the photographer. So there goes that. You know what they say: Oh well. You just can't do all that much with a 750-pixel-wide JPEG. And, as I'm sure you've noticed, there are rather a lot of them on the World Wide Web. What I would have done with the picture, of course, is to introduce it to a whole new audience and then link to the rest of the guy's work. I don't know if being seen by, I don't know, maybe thirty or forty thousand sets of eyes on TOP over the next week or two would have sold any prints for the guy. But it probably couldn't hurt. Again and again I get notes from people to whom we've linked telling me that we spiked their hit count big time. Copyright may be important for the big shots whose work is in tremendous demand. But I suspect it just helps small fry remain obscure. I might be wrong about this. (Again: Oh well.) My advice, though: If you're worried enough about your little JPEGs to attach copytight notices to them, make sure you also put your contact information somewhere nearby, so people like me can get in touch with you if they want to threaten your rights with some valuable free publicity. Recognizing the growing market for inexpensive online photographs, Corbis, the online stock photo company founded and owned by Bill Gates, plans today to introduce a Web site that allows anyone to upload photographs for sale. Called SnapVillage, the site is the latest entrant into the realm of so-called microstock agencies. 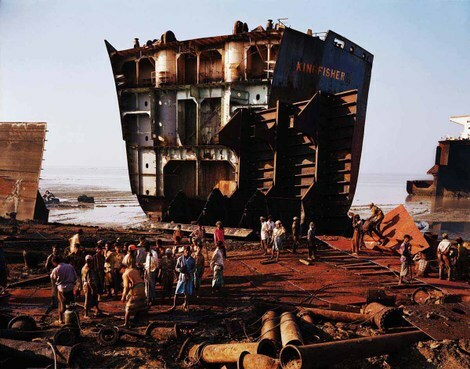 The Online Photographer has learned that photographer Bernd Becher has died. He passed away last Friday during a difficult operation at a hospital in Rostock, Germany. He was 75. 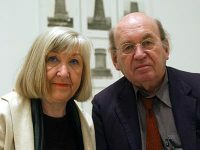 With his wife and collaborator Hilla Becher, Bernd Becher of Düsseldorf was perhaps the world's most well known and accomplished photographer of industrial structures. 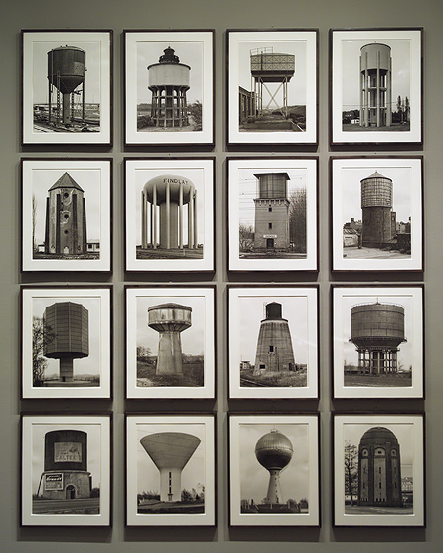 The couples' rigorous, stern method constituted a sort of comparative taxonomy of utilitarian structures, often presenting numerous examples the same type of structure together in the same work, always photographed in black and white, straight on, always in the same flat light under the same kind of leaden overcast or featureless white skies. The formal beauty of their investigations has long been appreciated, and has earned for Bernd and Hilla Becher widespread acclaim as art photographers. Their style never lost its interest, has not become stale, and remains instantly recognizable. Bernd Becher was also influential as a teacher, numbering among his students Andreas Gursky, Candida Hofer, Thomas Struth, and Thomas Ruff. Our sincere condolences to Frau Becher and to the artist's friends and family. It’s been a while since I’ve posted an installment in my series of articles on digital photography centered on use of the Pentax K10D camera. A number of readers wrote to ask my opinion of the Pentax FA Limited AF lenses, which have something of a cult status as premium lenses for 35mm film photography. There’s a trio of them, at 31, 43, and 77mm focal lengths. Recently, thanks to the elves in Golden, Colorado, a 31mm Limited found its way to my doorstep. This is the shortest lens in the trio, which is good because I do at least 99% of my photography with short or normal lenses. 31mm works out very close to a classic normal focal length (equal to the diagonal of the frame) when used on an APS-C digital sensor. It’s a bit wider than the traditional normal-for-35 length of 50mm. My first impression when I got it out of the box was that this is the most beautifully made and solid-feeling AF lens I have ever encountered. In fact, before I’d even gotten it onto a camera body, I had a sort of déjà vu sensation, really just a muscle-memory. It took a minute, then I realized that the lens reminded me, physically, of the Leitz Noctilux. Pretty exalted company to keep. It’s a substantial lens with lots of metal and glass in it. The wide focus and aperture rings are textured metal, not covered with plastic. The helicoid is very smooth, but not quite the oiled-silk feel of the best manual focus lens helicoids because, even when used in manual, there is some sort of gear being driven. There’s a barely audible whir and the slightest vibration feedback to your hand. You’d have to be a nut to object to it, though. None of this was a surprise, given the reputation the lens has earned over the years. What I was really curious about was how this legacy (i.e., designed for film) lens would perform in the world of digital capture. As mentioned, Pentax uses the APS-C sensor size so the lens is transformed from a moderate wide angle to a “normal” angle of view. Without getting sidetracked into something that is actually a very large issue, there are two important problems with legacy lenses. One is that film doesn’t care how oblique an angle the light rays from a lens strike it. Digital sensors do. With normal to wide lenses the angle of the light rays can be really oblique, and this can cause a lens that was very good at laying an image down on film to be a poor performer on a digital camera. When SLR cameras were introduced, “retrofocus” wide angle lens designs had to be invented. This is a lens that is physically farther from the film than its effective focal length, necessary to get the lens out of the way of the SLR mirror. A similar manuever is needed to make normal and wide lenses for dSLRs deliver their light rays nearly perpendicular to the sensor. The second legacy lens problem (there are more than two but these are the ones we can actually see and deal with as consumers) has to do with the highly reflective glass that covers the digital sensor. It bounces a lot of light back to the rear element of the lens, far more than film. This means that a lens meant for digital capture needs just about as much attention to anti-reflective protection for light coming back from inside the camera as it does for the imaging light coming in from the scene being photographed. I’ve used designed-for-digital lenses for all of my work with dSLR cameras over the past three years, but recently I tested a 28mm legacy lens that clearly showed both these problems. Definition wasn’t great anywhere, but got worse at the edges, even though this is not a wide angle lens in context, but a nearly perfect normal (format diagonal) length for the sensor. Worse, the internal reflection problem was, well, glaring. In any picture with bright highlights, the capture showed a highlight-colored overall haze of non-image fog/flare density. Nasty. So to conclude the first of several reports, let me go from that long-winded introduction to a short and sweet conclusion. In my use of the 31mm Limited—around 1,200 captures so far under a wide range of conditions —I can find no evidence of a “legacy problem.” In terms of resolution, including all the way to the edges of the frame, it is at least equal to results from the Pentax “pancake stack” of designed-for-digital compact DA Limited primes at 21, 40, and 70mm. Resolution is noticeably better than the designed-for-digital 12–24mm zoom, which is no slouch in its own right. I can’t detect any evidence of problems stemming from sensor flare. If the designers could do anything to make this lens more digital-ready, I don’t know what it would be. 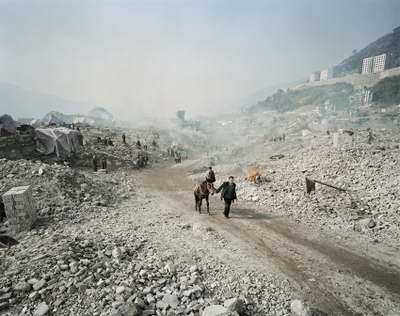 Last year, T.O.P placed Edward Burtynsky in the No. 3 spot on its Ten Best Living Photographers List, describing him, in Mike's words, as "the landscapist of the 21st century, the visual chronicler of humanity overrunning Earth." Or you could take Burtynsky's own self-assessment, a simple equation he laid out for reluctant Chinese authorities in the course of explaining to them why they should let him photograph the Three Gorges Dam. "I photograph big things," he told them, "and you make big things." 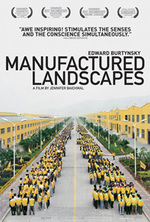 The film is largely shot in China and ostensibly follows Burtynsky as he makes images of that country's intense industrial expansion. It's artful, interesting and thought-provoking throughout, and worth making an effort to find if it makes its way anywhere near you. Photographers should be aware, however, that "Manufactured Landscapes" offers very little about Burtynsky's creative process and nothing about his photographic technique (other than what you can glean from fairly brief sequences of him using a 4x5 field camera). The film is much more interested in the ideas and questions implicit in Burtynsky's work—ideas about the foundations and consequences of our industrial/consumer economy and social structure. I’ve just come back from a tour of the Ilford factory. It was a full and long day, and something that you shouldn’t pass on if the opportunity comes your way. In fact, it might be that Ilford will do more tours in the future if asked...so get on over to APUG and search on "ilford tour" and look out for the name Simon Galley from Ilford. And ask. We got to see the film and paper making process from end to end (hint: obvious when you think about it, but a lot of this happens in the dark...you get given a dinky little safelight torch). We met the great and the good, but also had phenomenal access to engineering, scientfic and technical staff. They even made a strip of film in the light on their research machine to make sure we had seen everything. Brilliant. I don't know why it is that newspaper writers and editors think that perfectly competent and serious newspaper articles beg for titles that are puns. It's been a longstanding tradition—blight, is more the term—and for some reason it soldiers ever onward, ever undiminished. A newspaper writer or editor will use a pun for a title no matter how bad the pun is, no matter how much of a reach it is, even if it has very little bearing on the contents of the article and even if it adds nothing to the thesis of the article. Often, the phrase that's being punned has nothing to do with the article either. I honestly don't know why this mannerism has developed and survived, but a pox on it. The article at this link isn't a bad article, if you can get past the wretched, cowering spotted cur of a headline. It's a review of "two current shows presenting work from that decade suggest why our reception of color has been so blurry." Fine. So what has that got to do with "wish you were here"? Daniel Kunitz ought to be ashamed, and if it's not his headline, he ought to sue for defamation of his professional abilities and morever, elementary literary taste. Woeful. And a note to magazine and newspaper editors everywhere: If you must use puns, try to use them only when they actually work. Puns left as comments to this articlet will not be posted. I'm not in the mood. A pox on the pun, I say. Featured Comment by Hugh Crawford: "If you think you find that annoying, I've been hearing that phrase for 50 years. "I guess it's better than the people who think my name should rhyme with cough or though." 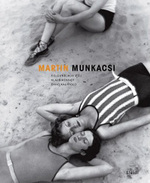 If you're interested in learning more about the Hungarian-born Martin Munkácsi (1896–1963), there is a new book by Klaus Honnef and F. C. Gundlach that my good friend Ailsa McWhinnie, Editor-in-Chief of Black & White Photography magazine, says is "absolutely superb and well worth the investment." The book however has different publishers and different covers depending on where you are. And in the U.S. it looks like this (above) and is published by Steidl, and is available on Amazon U.S. for $40.95. I haven't checked other countries or other Amazons. According to Photographic Artists and Innovators, Munkácsi was the first to take fashion photography out of the studio. He earned about $100,000 at the peak of his fame in 1940, which was more than any photographer had ever earned up until that time. That probably accounts for his famous quote: "A picture is not worth a thousand words. It's worth a thousand bucks." But sometimes, even I am impressed. 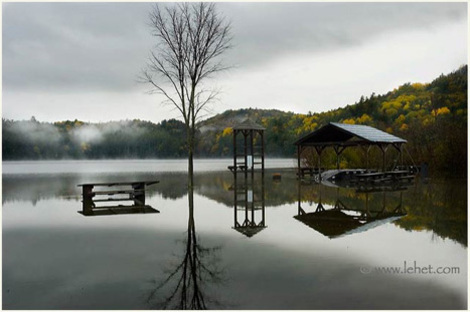 Nikon has recently run what I consider to be an exemplary ad campaign, called Picturetown. The idea is direct and pleasingly didactic: the marketers took a bunch of D40s and D80s and put them in the hands of a bunch of ordinary people in particular towns. (Watch the little video called "The Story.") What's not to like about that idea? You introduce a lot of people to photographing with good cameras, get a lot of nice-but-real pictures, and trigger some actual (as opposed to virtual) viral marketing. Nice idea, and I approve—whoever thought up Picturetown should get a raise, or at least a big vacation bonus and a hearty pat on the back. Even if it should prove ineffective as marketing, it's doing some good for photography, which right there is more than you can say for most marketing campaigns. Nice work, Nikon. So guess what I stumbled across the other day at my local big box store? A really cool store display with another super idea. Some genius at Sony (and this is one of the rare occasions when I'm using the term "genius" without irony—mark your calendars) simply yanked the sensor out of an A100 and mounted it behind a clear Plexiglas plate. The camera it came out of is still hardwired to it, though, so as you move the camera body, you can see the internal image stabilization work. Regular readers of this space know what a fan I am of image stabilization, and I hereby refuse to tell you how long I played with this display. (My ever-unruly Gear Acquisition Syndrome misfired, too, when I felt an urge to buy the thing—no, not an A100, the display.) One thing I noticed—Sony's "Super SteadyShot" IS deals with yaw and up-and-down and side-to-side motion well, but apparently can't compensate for twist (planar rotation). Good to know. Anyway, I was delighted to see this. If you ever meet the Sony marketing person who came up with this idea, give them a well-deserved pat on the back for me, willya? 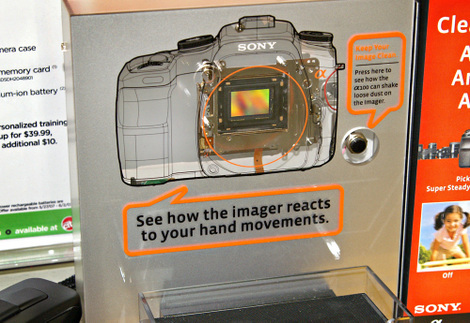 Featured Comment by Jernej: "Sorry to burst your bubble, Mike (about the genius at Sony), but that antishake display thingie was already quite a hit back in the days when Minolta was still around—Photokina 2004." Mike replies: Oh. Well. First time I'd seen it. I guess Minolta marketing is not likely to get its just rewards now, eh? Question from Scott Kirkpatrick: "What's a "hand-worked negative"? Something like a Gene Smith ferricyanide bleach job to get all possible detail out of a long-scale negative? Does this have something to do with why the stands in the background are greyed out while the figures in the foreground are crisp and contrasty?" Mike replies: One of my favorite New Yorker cartoons is of a crow sitting on a windowsill, saying, "At the risk of being obvious, I'm a talking crow." Well, at the risk of being obvious, a hand-worked negative is a negative that's been worked on by hand. When photographers used bigger cameras they got bigger negatives, so they could retouch directly on the negative, which is the job Edward Weston used to complain so bitterly about when retouching the portrait negs he did for pay would keep him indoors instead of out photographing for his art. The pictorialists often took retouching further, essentially "drawing" on their negatives to bring out properties and qualities they wanted in the image. In many cases the easiest manipulation was that you could "draw in" extra highlight density. 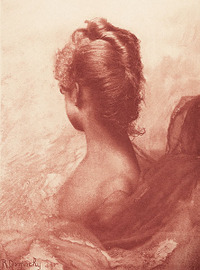 The ultimate example was probably the French photographer Robert Demachy, the great gum printer, who believed a photograph wasn't art unless the negative had been altered by the photographer (that's his "Study in Red" above right), although many of the pictorialists also did it to some degree. Munkácsi was working before the "straight" aesthetic was elaborated in the 1930s, and so, although he wasn't a pictorialist, he used some of the technical conventions of pictorialism that were standard for the era, including hand-working of negatives. If you click on his image above to get the larger version, you can clearly see hand-drawn crosshatching in various places on the two figures. The folds of the clothing and the hands of the figure on the left have been worked on as well. The light background is a result of overexposure due to excessive UV. These days, lenses have coatings and sometimes even cement between lens elements that cuts UV, so that an additional UV filter isn't really needed. In the '20s, before lens coating, and when they sometimes used organic cements (purified pine pitch, even) for lens elements, a UV filter had a larger effect. 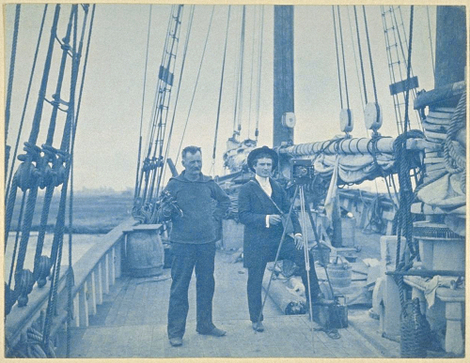 It was sometimes called a "haze-cutting" filter; the light background you see in this picture and many other pictures of the period is, in effect, the "haze." I often quite like the effect, personally, although of course it depends upon the picture. Too much money, too little image quality for me. Ergonomics count, fer shure. But, if the pix don't look good enough to begin with, it ain't gonna be a pleasure to use even if the controls feel like velvet. Not an earth-shaking revelation, granted, but it made me reflect again that I am personally very strongly motivated by results. Most of my interest in cameras and techniques is directed at results. I only care about viewfinders so much because I've found that I take better pictures when I can better see what the camera is seeing. I only care about small, light cameras because I find myself taking pictures in situations where unobtrusiveness helps me avoid unwanted attention (and that I find I take better pictures when I have a camera with me). I like pigment inkjet printers—but that's because I like the look of pigment inkjet prints. And so on. Paul Butzi got me interested in cameras with higher megapixel counts. Why? Because he made some really big prints for me—biggest by far that I've ever seen of anything taken by me—and they look really nice. If you want to make big prints, you've got to use equipment that will yield big prints. I was never interested in megapixels for megapixels' sake, and still am not. The corollary is also true. Nothing can turn off my interest in a product more completely than if I decide I just don't like the results, or if for some reason I decide that I can't use the product to take the kind of pictures I like. View cameras, for instance, have to be tied to solid ground at three points, and that limitation keeps them from being usable for maybe half the pictures I take and want to take. On the other hand, image stabilization and high ISO capability in digital cameras have made it possible for me to take pictures I couldn't take before. I know other people who primarily love platinum/palladium prints. With them, the "contact print" isn't the focus of their obsession—they only like contact prints because that's what most pt/pd prints have to be. Right now I find myself interested especially in the latest Olympus DSLRs, the E-410 and E-510. For some reason, pictures from Olympus cameras look better than their specs would predict. I'm not prepared to pass judgment yet. No verdict. But the few results I've seen from these two little cameras so far just look good, that's all. Good enough to make me want to learn more, see more, find out more. It's the results that count—the rest is just diversion. Addendum: Allan Janus has more on the duck. "...We've now shot multiple games of soccer and rugby plus track, indoor volleyball, moving cars, grip and grins, an executive portrait and personal stuff. It's added up to over 15,000 frames across two production EOS-1D Mark IIIs, and the most obvious autofocus theme to emerge after poring over all these pictures is that when the lighting is full sunlight and it's a nice day outside, the autofocus is unusably poor. The camera will still produce in-focus pictures...but the ratio of crisp to blurry frames is well below an acceptable level." Read Rob Galbraith's detailed report of the new Canon flagship's AF woes. 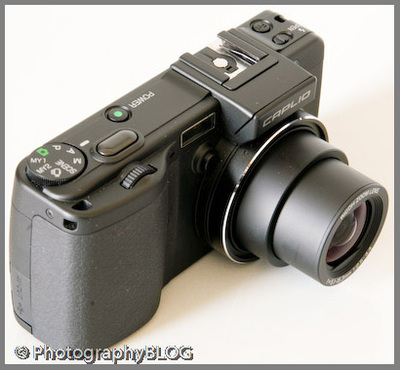 PhotographyBlog has published a review of the Ricoh GX100, a thinking photographer's digital compact. “The specification of Ricoh Caplio GX100 reads like a dream wishlist for the discerning photographer. Wide-angle 24–72mm zoom lens? Check. Adobe DNG RAW format? Check. 10 megapixels, removable electronic viewﬁnder, optical anti-shake, full manual controls? Check, check, check and check! 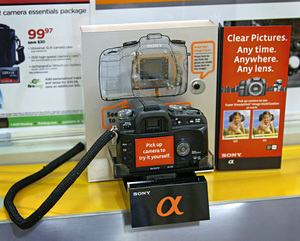 So the Ricoh GX100 certainly has a lot to offer on paper, but can this compact digital camera live up to its billing?"